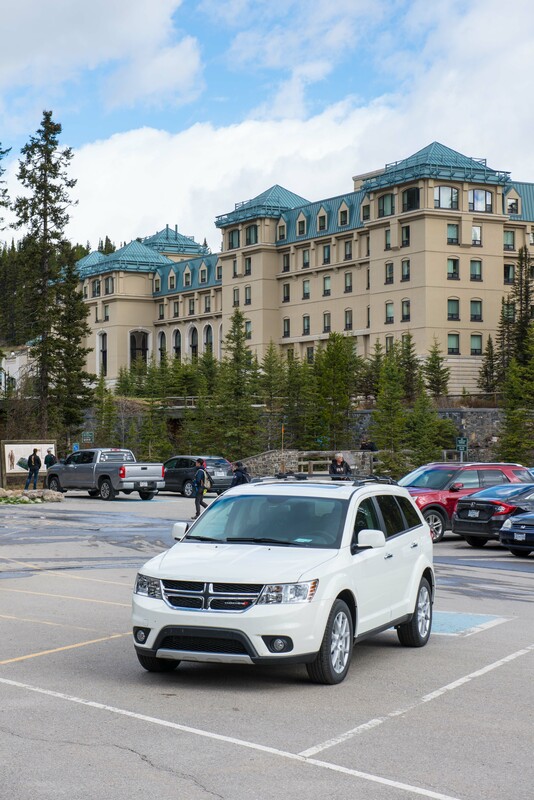 The Lake Louise car park with the Chateau in the background. So after another excellent breakfast we headed north towards Lake Louise, about 60km north along our old friend Hwy1. Lake Louise consists of a small hamlet (called ‘the village’) next to the highway, plus an even smaller hamlet at a much higher elevation next to the eponymous lake. The lake itself is named after Princess Louise Caroline Alberta, a daughter of Queen Victoria. Next to the lake is the famous Chateau Lake Louise, a massive semicircular grand hotel overlooking the lake view. We got there fairly early in the day and drove straight up to the lake car parks. Even though we were early, several tour buses and their passengers were already milling about. It was a short walk from the car park to the lakeside and of course one of the most famous views in Canada. Even though it was June, there was still a lot of ice on the lake’s electric blue waters. 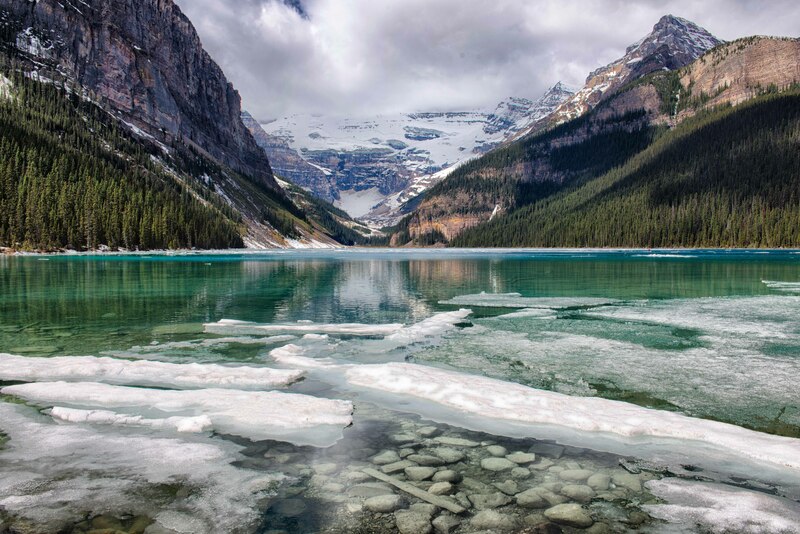 Classic view of Lake Louise. A bit cloudy over the mountains today, sadly. We went for a walk around the path alongside the lake to take in the scenery from different angles, and of course you can then look back towards the Chateau and see it much more clearly; where the car park path emerges it is so large and close as to be overwhelming. On returning to the start we went looking for a late morning cup of coffee. View from round the footpath of Lake Louise. Unfortunately, despite exploring the ground floor of the Chateau, there didn’t seem to be anything open to non-residents except for a takeaway ice-cream kiosk near the path entrance. The Chateau Deli was closed for an unspecified reason, whilst there appeared to be a 30 minutes wait before the Poppy Brasserie might open. There were five more restaurants within the hotel somewhere, but they seemed to be residents only. Anyway, not fancying an ice cream we elected to drive down to the village and chance our arm at the Samson Mall. 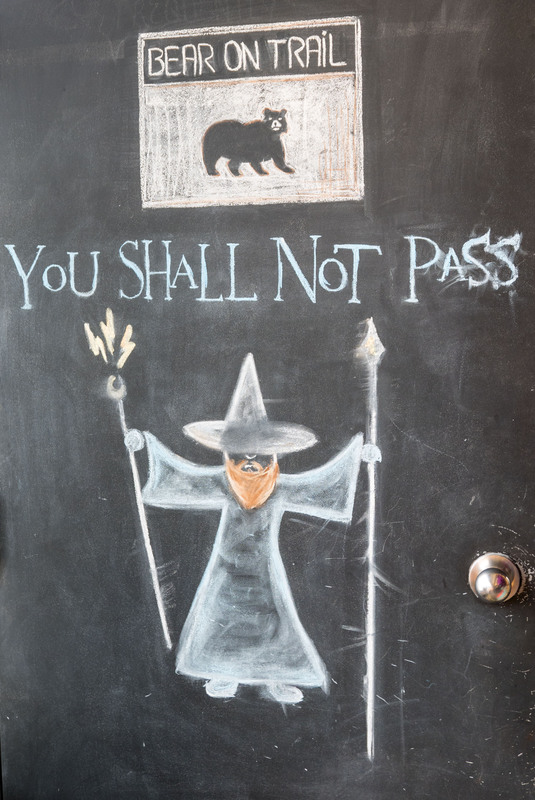 The Trailhead Cafe seemed a bit busy, so we elected to try the very slightly less busy Laggan’s Mountain Bakery & Delicatessen. Managed to get a table, a coffee and a bun alright, though the place was a bit cramped and crowded. With that dispatched we had a quick look round the mall, though there was nothing to hold our attention for long. 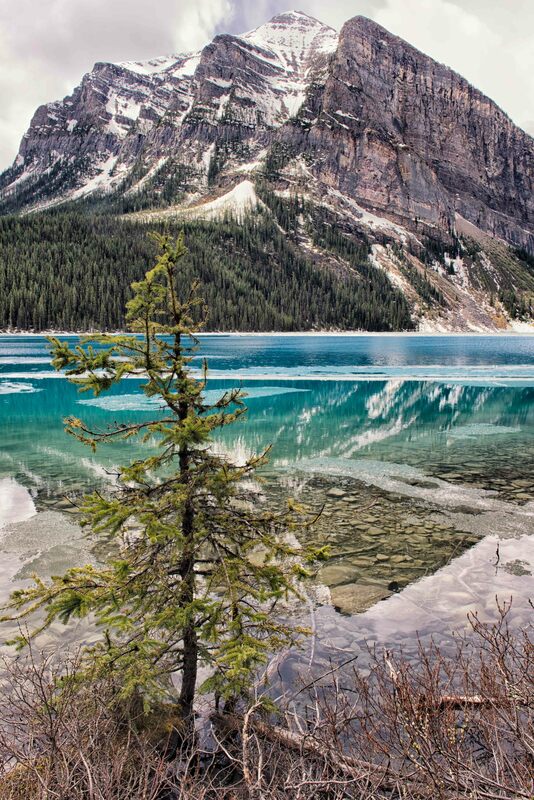 It was far too early to return to Banff, so we elected to drive the 15km out to Moraine Lake, with the turnoff just off the Lake Louise road. The road climbs another 150-odd metres in that 15km and you can definitely feel it getting cooler. A few km up the road and the traffic ahead seemed to go into a sudden scrum. As we approached it became clear the cars were cutting in and out of each other, overtaking and stopping, then counter-overtaking and stopping again, trying to get a close view of something on the verge. Soon we caught up to them and there they were, a whole group of mountain sheep causing immense excitement. Having see them yesterday, we just watched for a short time, and then drove on. 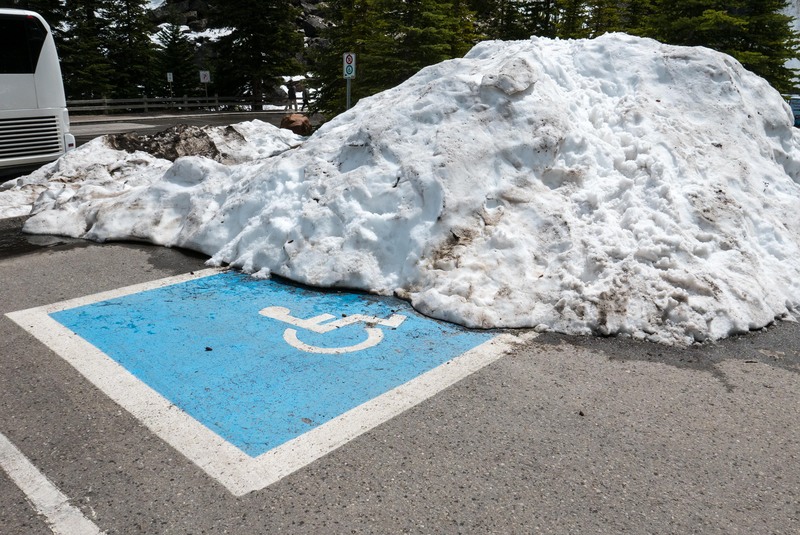 Disabled parking bay emerging from under the snow at Moraine Lake. When we reached the end of the road and the lake shore, as we got out for a look round it was quite patently colder, with lying snow where the snowblowers had piled it up, most of the lake still covered in ice and a definite hint of sleet in the air. Apparently it can snow at any time of year up here. We didn’t linger, even with out coats and fleeces and headed back down the lake road. 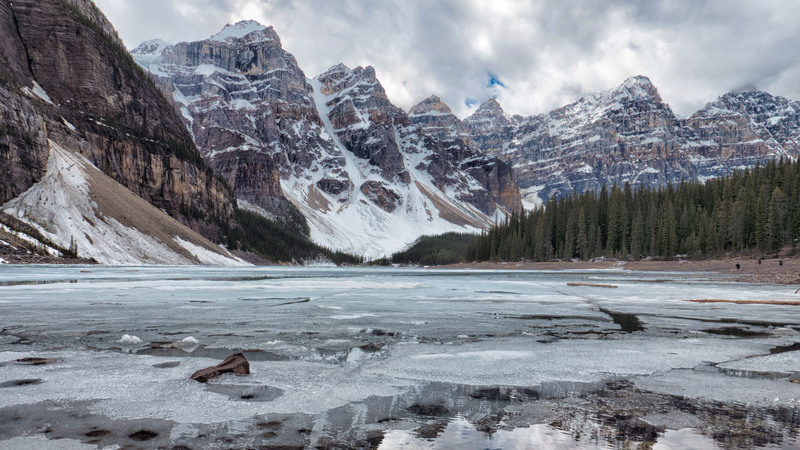 Moraine Lake, Alberta, still covered with ice in June. We hadn’t gone too far when we again came upon a lot of traffic, only this time strung out in a queue rather than huddled round some beast. At this point a wooded hillside rose sharply to the left of the two-lane road, with a long, bare, steep scree slope to the right, descending a couple of hundred feet to a couple of small lakes . Several cars were parked along the shoulder of the wooded side forcing oncoming vehicles into our right-hand lane to overtake them and causing the queues. It was hard to work out what was going on at first, until I happened to glance down the scree slope to see an incredibly battered and smashed black SUV part-way down the slope. I drove a bit further until there was a layby and pulled over and walked back to see if there was anything to do (or see, if I am honest). There didn’t seem to be anyone injured or hurt, or anyone attempting to reach the fallen SUV, so I can only surmise the people escaped or weren’t in the vehicle when it happened. It wasn’t long before two Deputies arrived from the village below and started getting people to move their cars. He didn’t seem that bothered at getting down to the SUV either. I could have taken a photo, but it felt insensitive at the time, so I didn’t. We took it a little slower on the downhill run (and passed a Fire & Rescue truck barreling up en route) and made an uneventful return to Banff, for a quiet late afternoon and some tea.